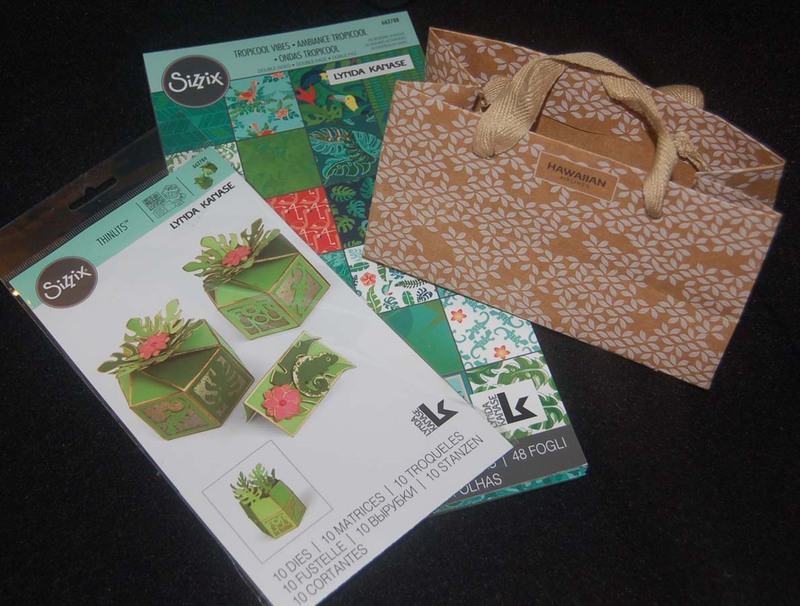 As soon as I saw the Sizzix rectangle box die set at HM Ben Franklin Crafts, I knew it would make a beautiful planter box card. By using a 12x12 card stock sheet that looked like whitewashed wood, I thought I could imitate a real planter box. 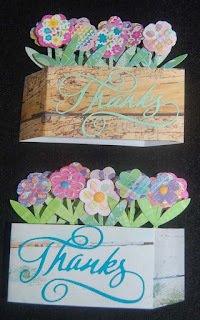 I cut off the flaps so that the box looked more like a planter and less like a package. 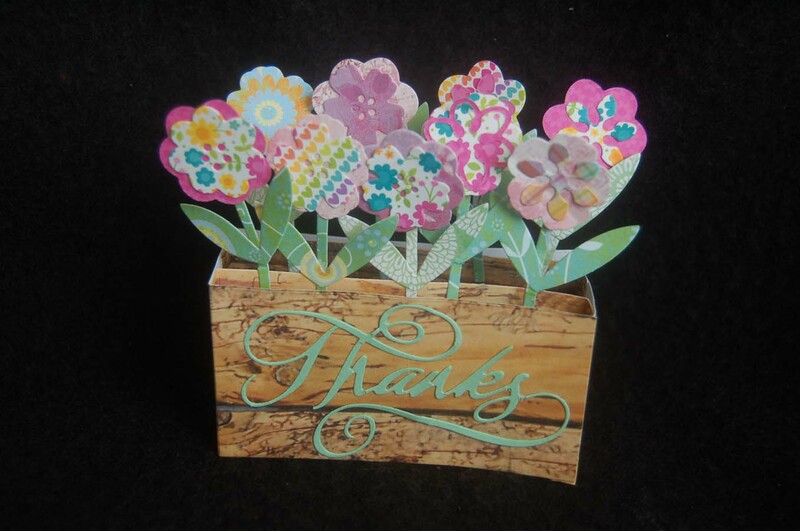 I added the sentiment (Impression Obsession) die cut from blue card stock before 'planting the paper flowers'. 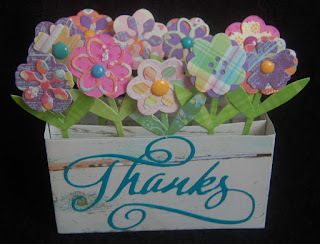 The colorful flowers were cut from all the scraps I had scattered on my craft desk....great way to use up scraps! 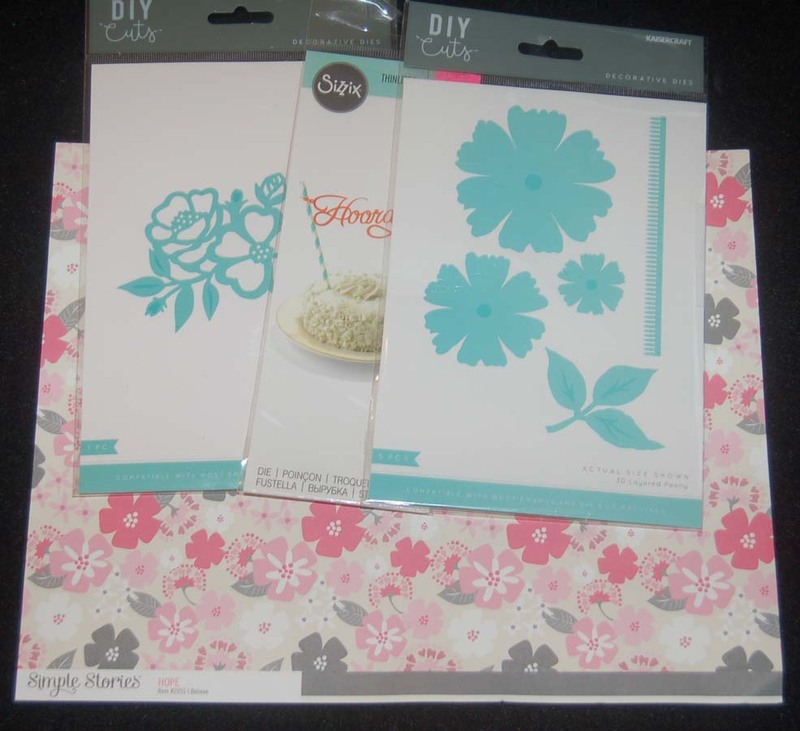 The die set has lots of flower shapes so an assortment was created and I added a few enamel dots for accents. 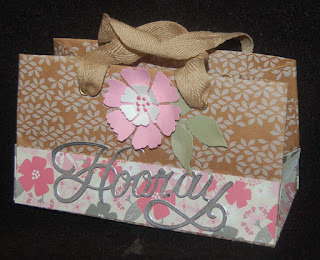 Here is another version that I made using woodgrain cardstock. Flattened, the cards fit easily in envelopes for mailing. Your personal message can be scripted on the back of the planter box. 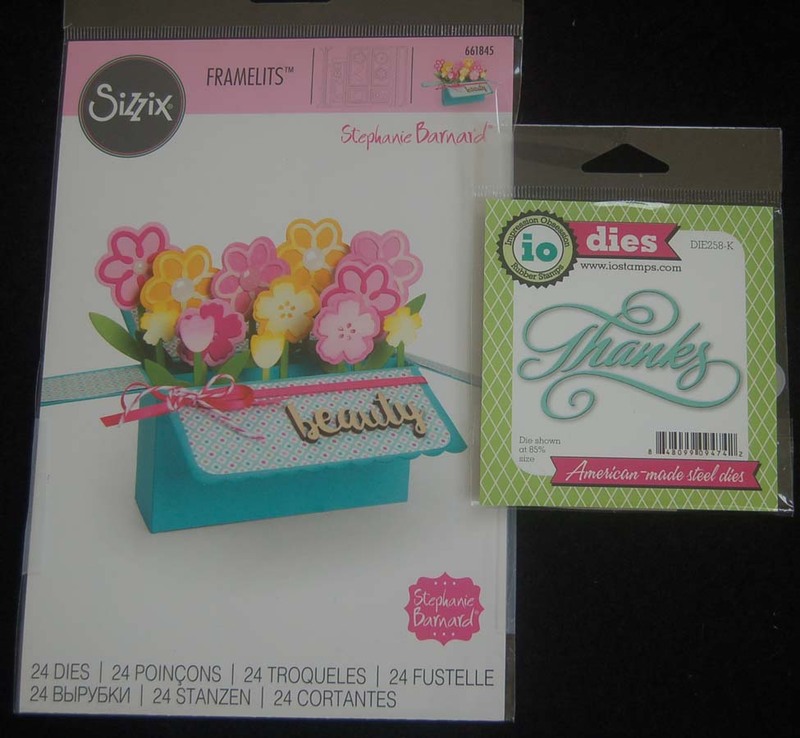 The supplies for these cards are minimal because all you really need are the dies, faux wood cardstock and LOTS of colorful scraps. Hope you'll have fun planting a paper flower box! I love the Doodlebug Designs stickers. 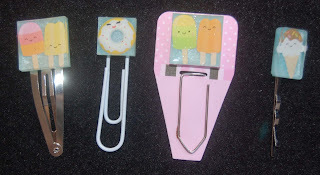 They've inspired me to create some cute resin items. Using the UV resin available at HM Ben Franklin Crafts and small silicon molds (also sold at BFC), I put a thin layer of colored resin into the bottom of the mold and hardened it before inserting a sticker. Next, I added a layer of clear resin to fill the mold. After setting the resin under UV light, I glued or attached with more resin the encased sticker onto a clip for hair or paper. Here are a few more samples of the pieces I've made. (Sorry the photo is not too clear.) 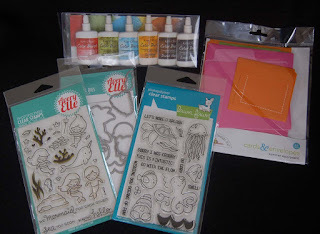 I am excited to try other mold shapes and Doodlebug Designs stickers. 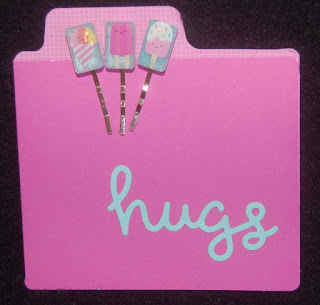 Oh, the file card is from the Doodlebug Designs card set and with the addition of the die cut (Lawn Fawn) 'hugs' seems like the perfect vehicle for sending a greeting and small gift. It's so nice to get 'happy mail' !!!! Much to the consternation of my husband, I often save bit and pieces of ephemera from our trips. He was frowning big time when I declared that I was bringing home the Hawaiian Airlines snack bags from our Japan trip. 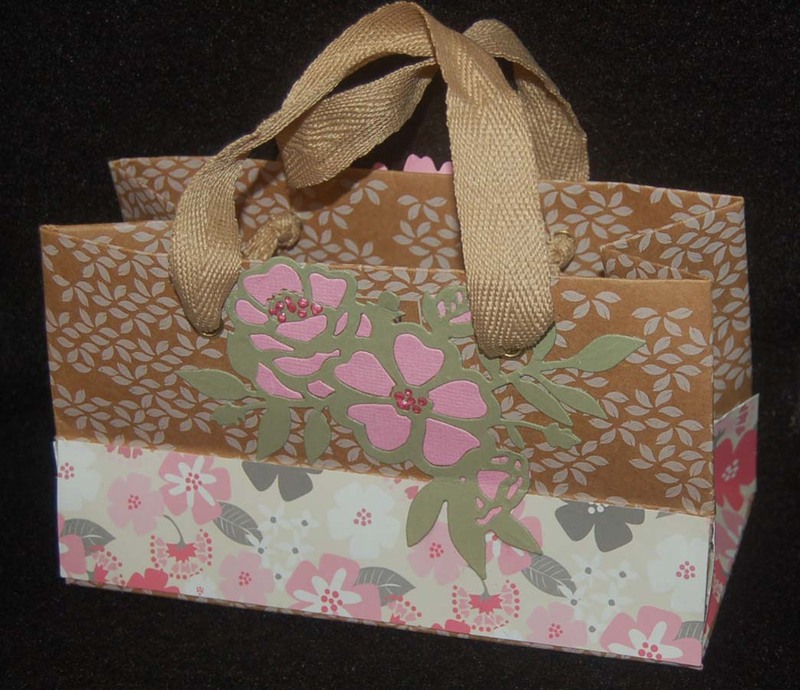 I knew these sturdy printed brown bags with woven ribbons handles could easily be fashioned into a usable gift bag so I ignored my husband's doubtful glances. 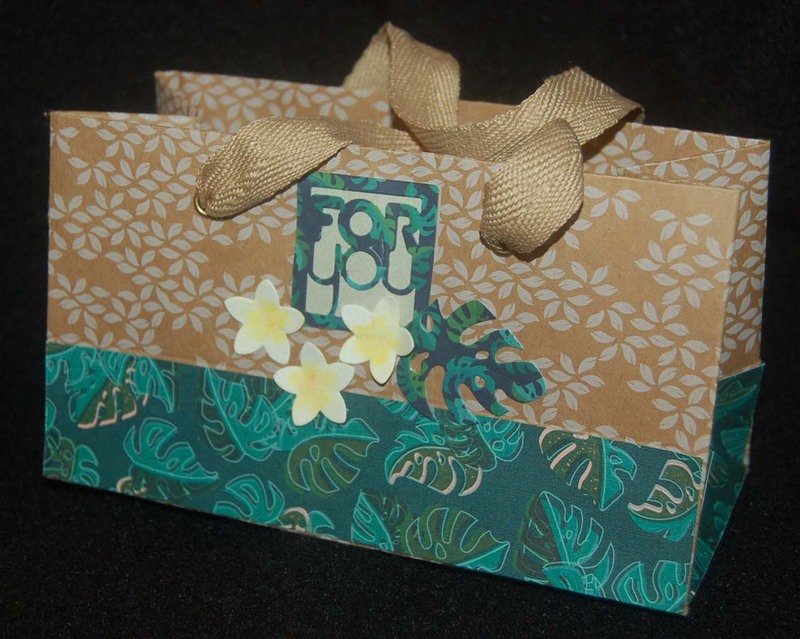 It was simple and quick work to measure the bag and cut strips of paper from the Sizzix long tropical print paper pad to fit the bottom portion of the bag (below the fold). 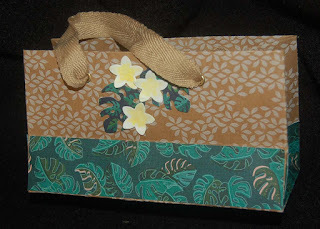 Then I used the dies from the Sizzix die set (with the gecko) to cut the plumeria flowers (watercolored the yellow centers) and leaves that matched the decorative paper. The 'For You' label (on the front of the bag) was cut using one of the dies also from the set. A backing paper was attached to make the words more visible and the corners were rounded. The flowers, leaves and label all help to cover up the airline logos on the front and back of the bag. 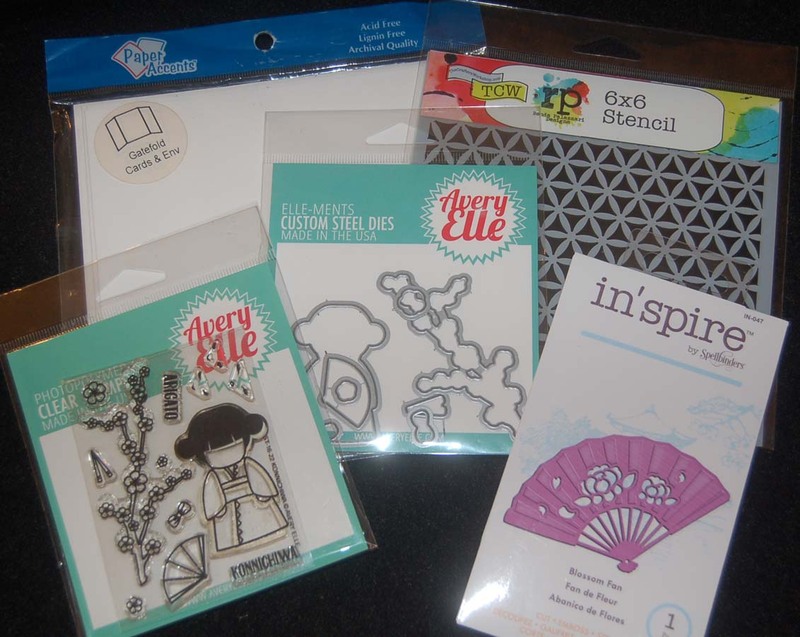 I love both the paper pad and the die set because they are so usable for Hawaii crafting projects. 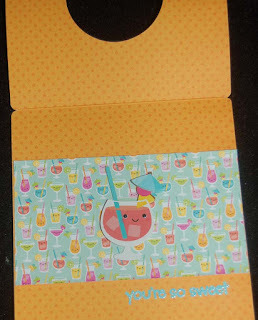 The die set actually makes an adorable little party favor box which I'm sure would be perfect for an outdoor wedding. 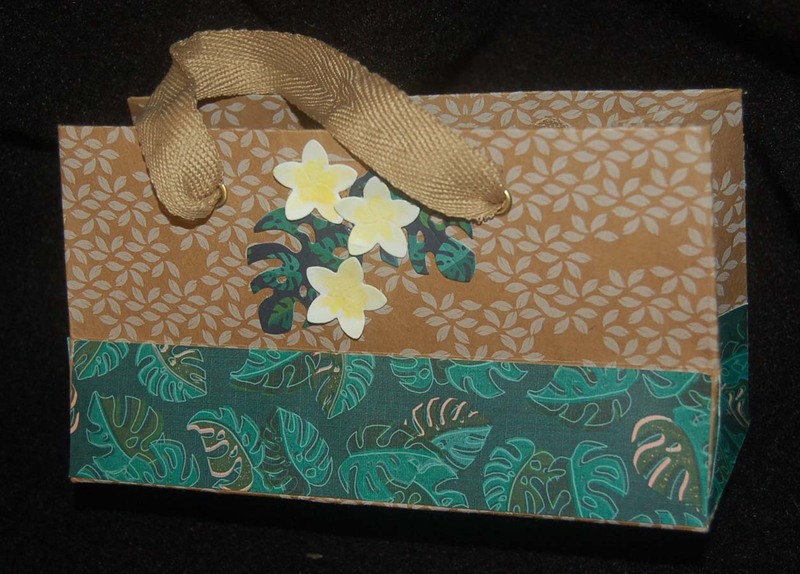 Everything for this recycling project was purchased from HM Ben Franklin Crafts except for the brown bag....you'll have to go to Japan on Hawaiian Airlines to get that! When I first started imagining this card for my family friend who is getting married for the first time at age 62, I had an entirely different look in mind. As I looked through my drawer of wedding stuff, I discovered a stamped wedding cake image (Stampendous) to which I had added some frosting stickers and colored a bit. Maybe this was my back up image for another card but for some unremembered reason I didn't use it. The frosting is sort of rubbery but looks quite real so I like the effect. 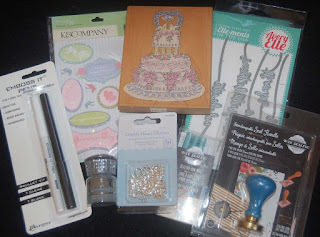 If you cannot find frosting stickers, perhaps you can make some from Hearty Clay or the cake decorating resin. 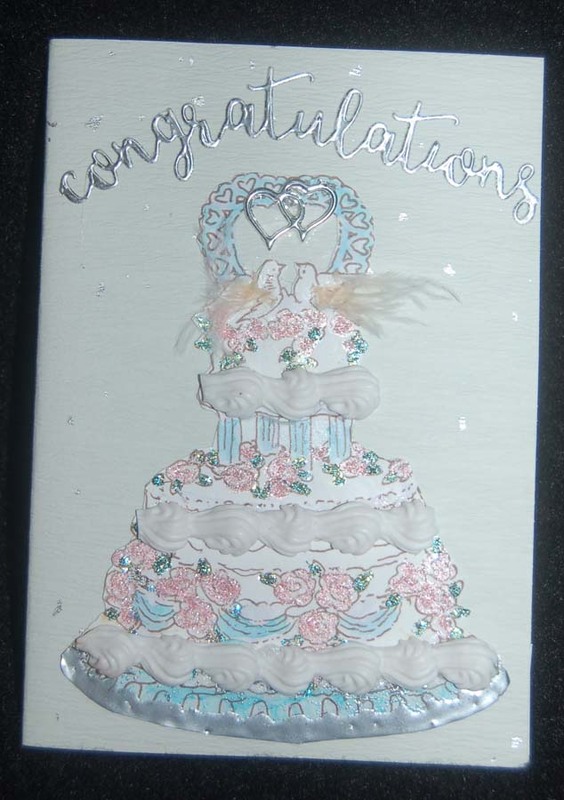 The 'Congratulations' was die cut ( Avery Elle) from silver foil card stock and glued to a Japanese card blank with silver specks. 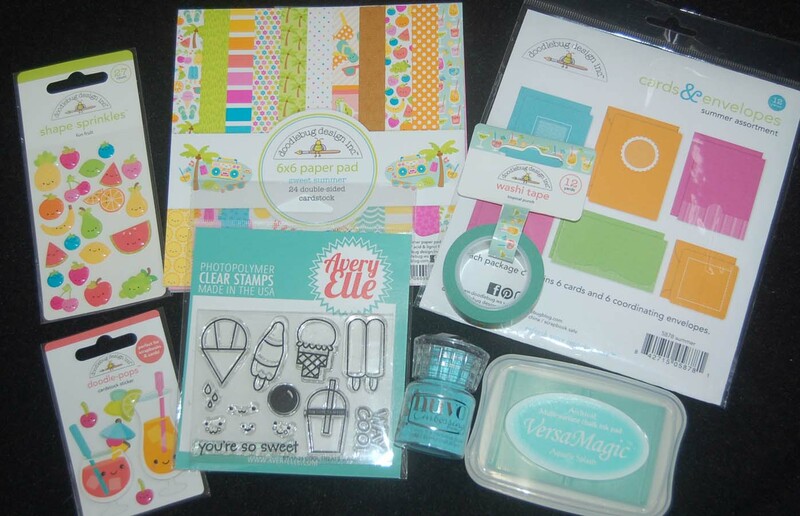 (Check Celebrations store in Mapunapuna for a selection of pretty washi paper to use.) The cake was colored with Copic pens and some glitter. I tried heat embossing the bells on the top of the image like I did the platter, but the delicate design melted into blobs so I cut out the bells and replaced them with a silver heart charm (from HM Ben Franklin Crafts)with the loop cut off. 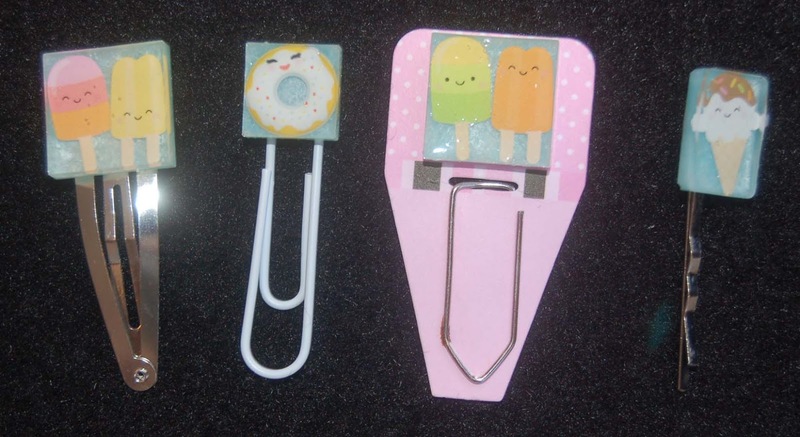 BFC also has embossing pens which were used to color in the platter so that the embossing powder would stick before heating. I added the feathers to the birds just to add more interest and balance off the bottom heavy design. The inside of this card was hard to photograph because of the shiny bird sticker and adhesive strips of silver foil. It really does look quite lovely with the embossed corner pieces. I especially love the saying on the K and Co. sticker, " The heart that LOVES is always young". Isn't that appropriate for the man who at 62 finally found his happily ever after lady love? 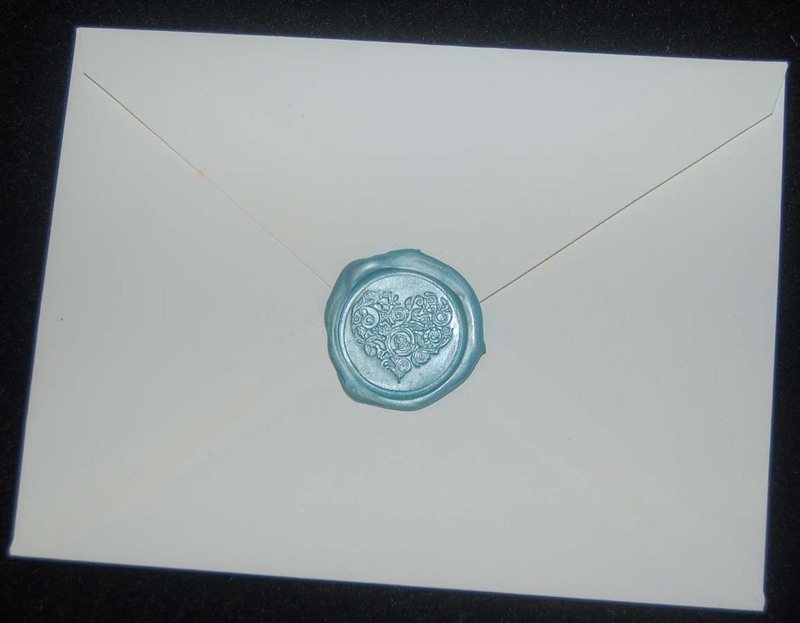 Of course the finishing touch was to add a sealing wax to the envelope. (I melt my wax on a silicon sheet before stamping and glue the finished seal. 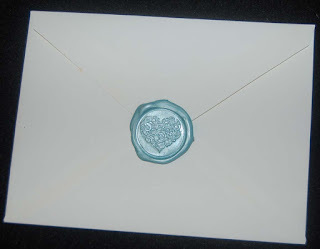 This ensures that I can place it perfectly on the envelope after writing my greeting in the card. In case you missed my previous post, the supplies for making the heat gun wax seals are now available at HM Ben Franklin Crafts, the best local store for all your crafting needs. Happy shopping and crafting! This card was made in a hurry because I just returned from Japan and realized I needed a birthday card and something to post. As you can see, I am still in a Japanese frame of mind. 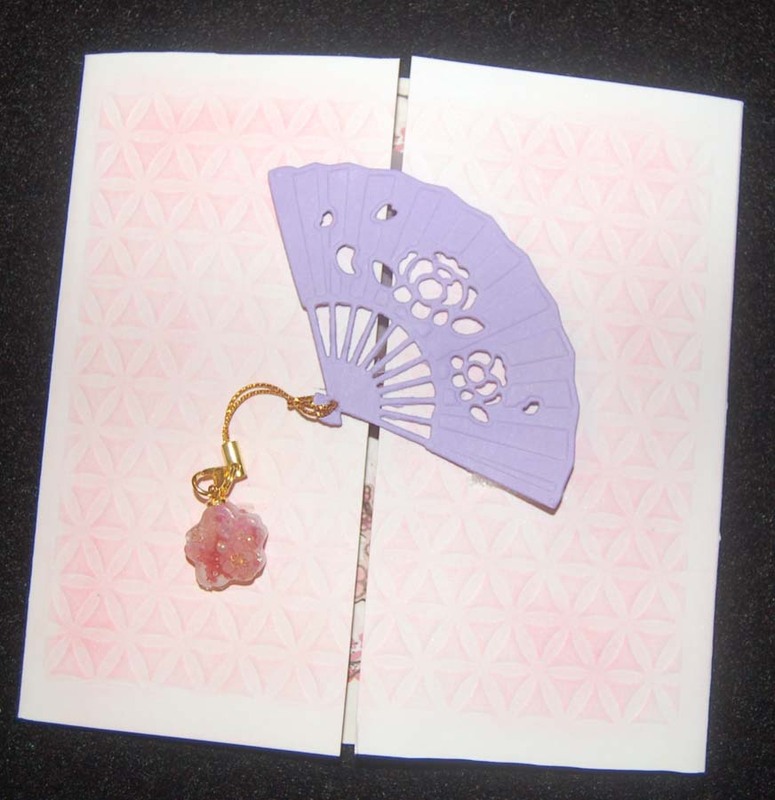 I started by impressing the 6x6 Paper Accents gatefold card (from HM Ben Franklin Crafts) with a geometric design TCW stencil (also from BFC), Then I dusted the impressed design with pink chalk and die cut the Inspire fan. 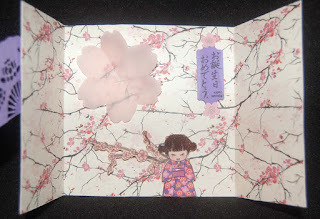 I cut a panel of Photo Play cherry blossom card stock to fit inside of the card and used double stick tape to attach it. I used the Avery Elle girl and cherry blossom branch stamps with the matching dies. The girl was cut from pink card stock and her face was stamped and colored in. 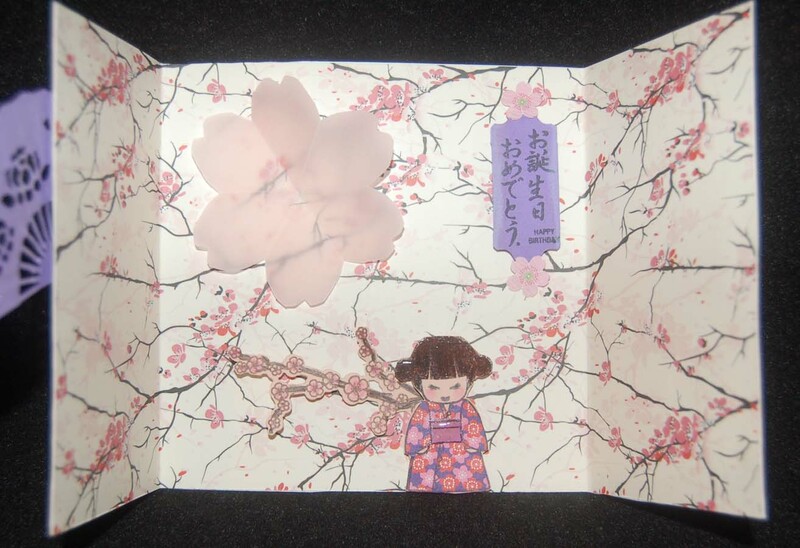 The kimono and obi were paper pieced from origami paper and her hair was enhanced with Glossy Accent. The cherry blossom branch was added behind the girl to give some dimension. The lavender 'happy birthday' label was made with an old stamp from my stash. To make the large pink vellum cherry blossom (for writing my birthday greeting)I punched out a circle and then folded it into six triangles (like making a snowflake) and hand cut the petal shape through all the folds. Here is a close up of the resin charm (sorry poor photo) I made using a cherry blossom mold. 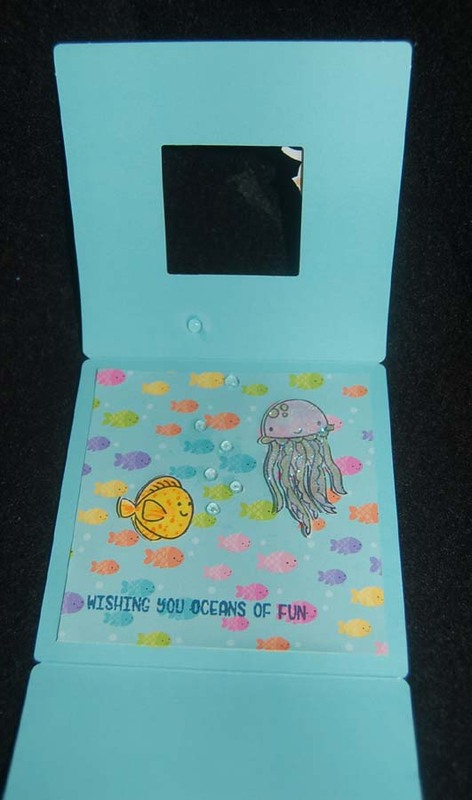 There are assorted inclusions including a pearl, metal flowers, mica glitter and a printed acetate flower. 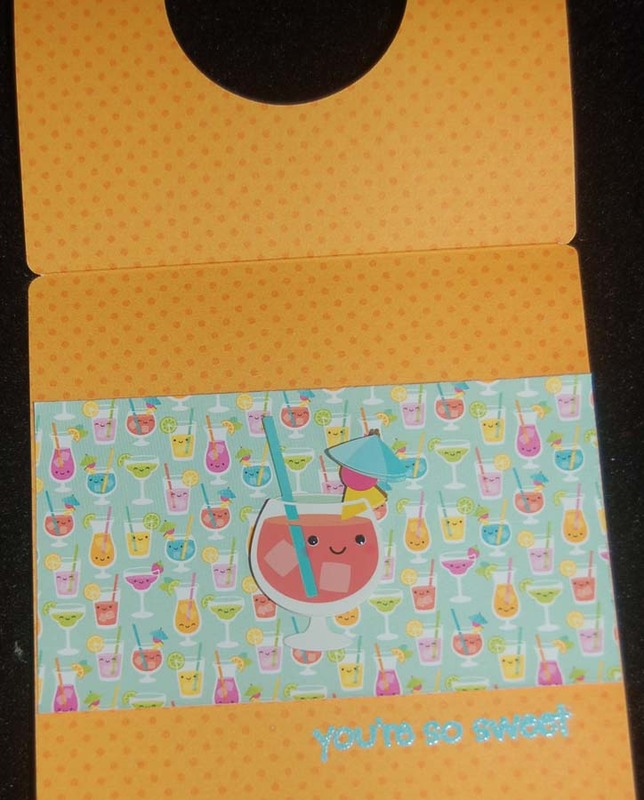 The charm is attached to the die cut fan which with Velcro tabs on the right side is the closure for the card. 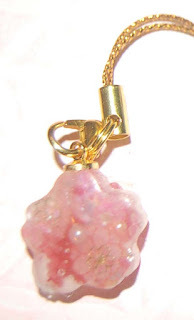 I wanted to give the card recipient a small gift of a purse charm with the card to let her know that I wish her a very special "Happy Birthday"! 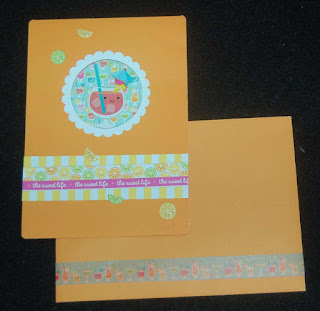 Because I liked the assortment and summer colors of the Doodlebug Designs envelope and cards package set, I again chose to use a card from it. 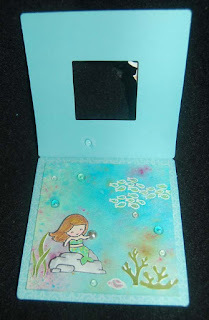 This aqua one reminded me that I needed to use my mermaid and ocean themed stamp sets. 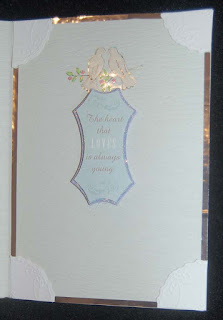 I don't normally use white embossing powder for my stamping but on this card it worked. Tip: Stamp with ink of the same color as the card so that mistakes won't show. 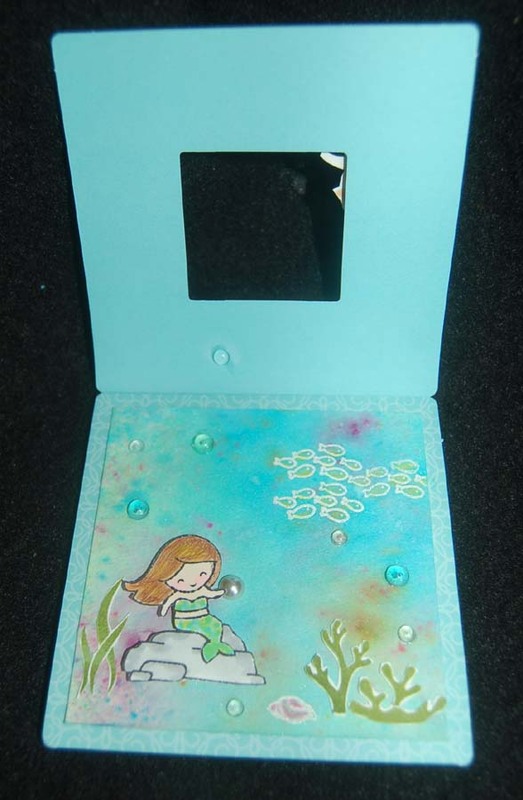 The white embossing powder will stick to the ink and when heated leave a raised white design. Both the mermaid and merman were stamped, colored, and fussy cut before adhering to the card with foam dots. 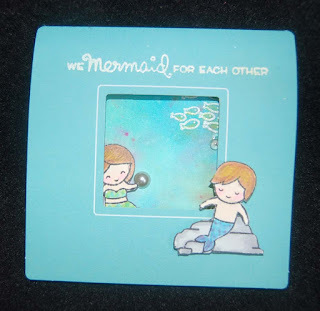 I will need to get the dies for this stamp set because it was tedious to hand cut the seaweeds. For added interest, I glued on some acrylic dots and added a sticker pearl. Oh yes, I watercolored the background with Ken Oliver Colorburst inks. 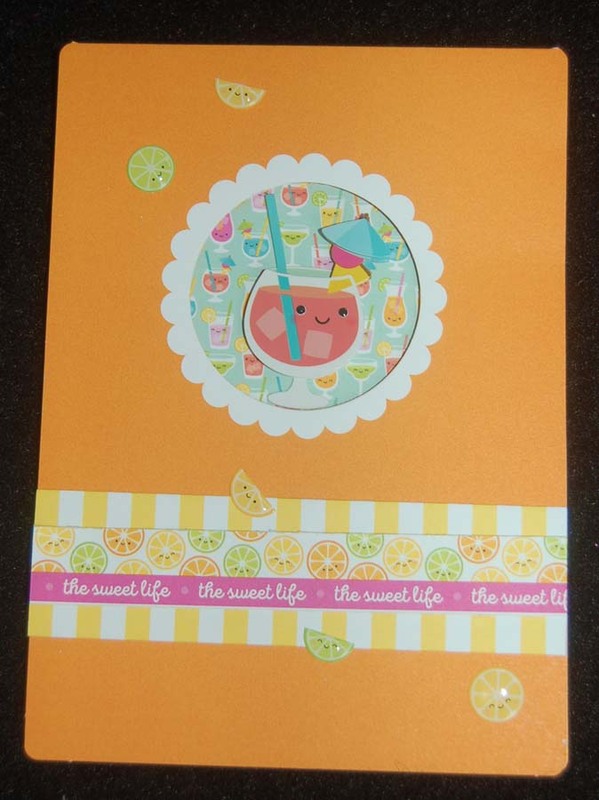 Since this card unfolded into such a large blank space, I decided to add some decoration to the inside panel. I chose a Doodlebug Design paper and added some of the sea creatures (dressing them up with glitter and Glossy Accents). 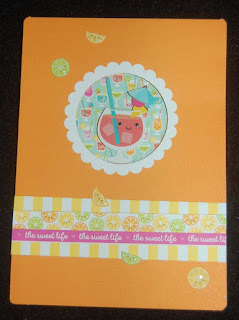 I'm not sure who will receive this card so I left the option of covering the stamped sentiment with a banner saying 'Happy Birthday' or perhaps ' Congratulations'. It's always satisfying to have some basic cards ready in a stash for emergencies. Don't you agree?